A photo of the Texas World Speedway press box from fall of 2017. 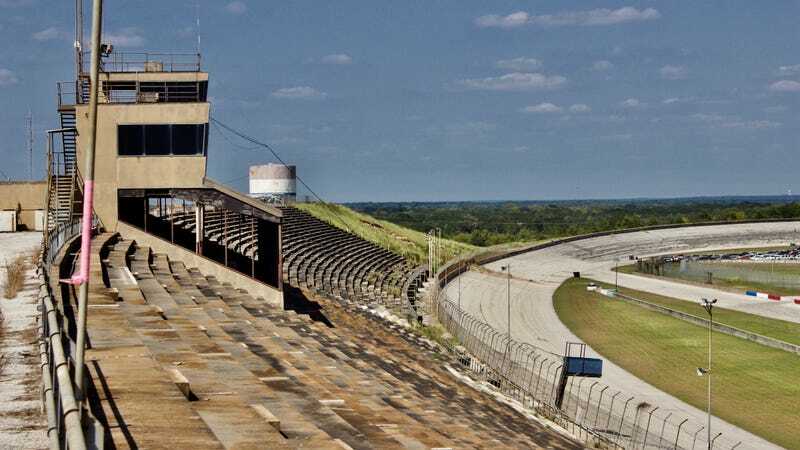 The figurative dismantling of the decaying Texas World Speedway, once a massive, high-speed oval that hosted the top tiers of U.S. auto racing, began when those tiers bypassed it for more convenient, better-located venues as early as the 1970s. Decades later, the actual dismantling has begun, as the first houses in a subdivision that will eventually pave the track over are under construction. That’s according to the track’s developer, Bill Mather, and aerial photos taken this year that show the veins of the subdivision’s first paved roads creeping into the edges of the track. A clean slice was cut from the outermost corner of Texas World Speedway’s road course many months ago, replaced with a street that turns off toward the first two house plots under construction. The photos, kindly sent to Jalopnik by reader Clint Sare, show the track at the time he flew over it in late January, with the dotted line roughly showing the part that’s already gone. 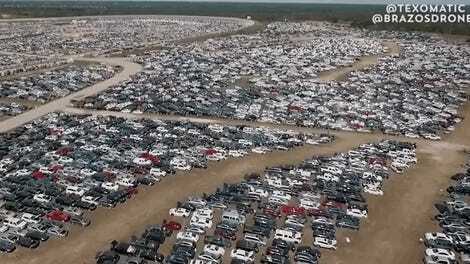 Although it’s been just about a year since the thousands of Hurricane Harvey flood cars being stored at the track by insurance-auctioneer Copart cleared out, Mather said the first residents in the neighborhood that will eventually replace Texas World Speedway, the 2,000-home “Southern Pointe” community, could arrive in the next 60 to 90 days—race track as a backdrop and all. But Mather plans to take the track apart in pieces rather than all at once, and told Jalopnik in a phone conversation this week that it would be “a wild guess” as to when it would be gone entirely. Two more areas of the subdivision are in the design and approval stage, he said, with the first being outside of the oval and the second penetrating the southern end of it. The two houses can be seen at the end of the street closest to the track, next to each other. “In a reasonable period of time, the southern part of the track could be gone in two to three years, maybe,” Mather said, but added that nothing was concrete. The plan wasn’t always for Texas World to go out on such a quiet note, though, and there’s still a slight chance that it won’t. Mather said he planned to reopen the road course—the only part of the track that’s been usable for years—to drivers and clubs after Copart left, but there were some complications. While the far loop of the road course that extends outside of the two-mile oval has had a chunk out of it since around the time of the hurricane, Mather said his idea once Copart left was to open the shorter road-course configuration. Mather said he actually staged some construction with that in mind, but that the idea has yet to come together. The heavy machinery hauling the flood cars around damaged the track surface, he said, to the point that what’s left of the road course is a mix of asphalt, dirt and gravel. An agreement wasn’t reached with Copart on how to return it back to race condition, so, for now, there it sits. Texas World Speedway in 2015. As for the slices into the turns of the oval, which can also be seen in the photos, Mather said that was done to run a sewer line across the property—something that made more sense to do, monetarily, by chopping up the banking. No matter the situation, Mather said he’s always hesitant to say that the track won’t run ever again, until there’s no track to run on. But he did say he doesn’t see an opportunity to reopen it right now, and that it’s “highly unlikely” there will be any racing there in the near future. But until it’s all gone, people who move into the area will have a towering track in their backyards—press box, high banking and all. It’s more of an aesthetic thing since there likely won’t be any racing, but Mather said builders aren’t worried about that affecting sales, “as long as the homeowners understand or get the picture” of what the eventual product will be—a place with jogging trails, a school, parks, and no race track at all. Not much high-level racing has gone on at Texas World since its early years, and, given its early plunge from the national spotlight, it became a case study for the chronology of the decline of major race tracks long before closing tracks became an epidemic. The track, which held its first sanctioned race in 1969, was gone from the calendars of the top levels of NASCAR and the USAC Championship Car series just a handful of years after its opening. AJ Foyt won the last USAC Indy car race at the track in 1979, according to the Racing Reference database, while Benny Parsons won the last NASCAR Winston Cup one in 1981. In sharp contrast, Texas World’s northern, nearly identical sister track that was built at the same time, Michigan International Speedway, has two dates on the calendar of NASCAR’s top series in 2019 alone. There were a few reasons Texas World didn’t fare as well in the top levels of racing. The track was built on the outskirts of what was then a small college town, aptly named College Station, which didn’t have much of a surrounding population to fill the grandstands. The largely unpaved infield wasn’t up to par for elite racing series that visited, and the small highway leading to the track just wasn’t doing it. Attendance numbers for the big leagues at Texas World, as a result, were half of what they were at Michigan International Speedway. When NASCAR’s top series left after the 1981 season, Texas World Speedway’s prime ended—just over a decade after it was built. After the big names left, Texas World became a destination for mostly hobby and amateur racers. The banking on its two-mile oval deteriorated over time, to the point that only its road course was left to safely use. And people used it. But for years, rumors that the track could be bulldozed for a subdivision loomed. In 2017, those rumors had a name: Southern Pointe. Documents filed with the City of College Station in December 2017 showed the final iteration of the rumors: The Southern Pointe community, whose plans, in addition to nearly 2,000 single-family homes, include two commercial lots, an “urban lot,” a school, a proposed fire station and parkland on 553 acres. The track, which hasn’t gotten much national attention since in decades, was in limbo for years before Southern Pointe became official, going back and forth between becoming a subdivision and, somehow, getting saved in its current form. By then, it was no longer the major sports venue it was built to be, and was instead a smaller operation targeted toward hobbyists and driving schools. But that growing college town was closing in on it, especially after the local Texas A&M University joined the South Eastern Conference in 2012, and it became hard to believe the latter option would win out. Texas World Speedway in 2017, dead weeds creeping through what used to be part of the grandstands, as flood cars were just beginning to arrive at the track. The track made headlines again, perhaps for one of the final times, in 2017, when it became a dumping ground for the Copart flood cars after Harvey hit the Texas coast. But those cars moved out soon after they came in, things got quiet again, and work went forward on the subdivision. Even with work moving forward, though, the construction schedule for the rest of the subdivision remains to be seen. The ghost of what used to be will also be seen, quite easily, since Texas World’s new neighbors will have an old race track in their backyard for at least a few years.